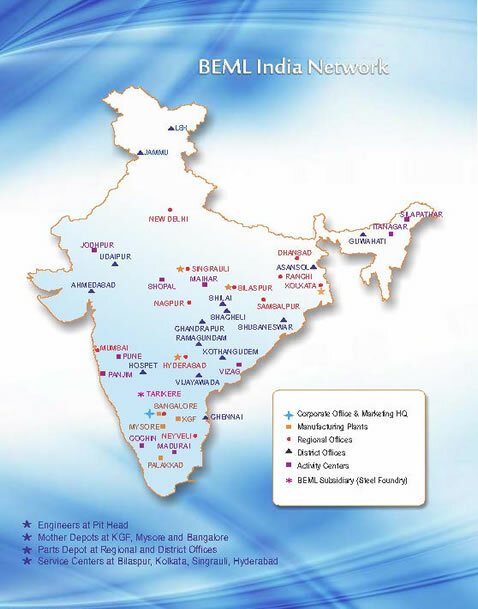 BEML Ltd has nationwide network for After sales and service of Mining & Construction Equipment spread across India, with 12 Regional Offices and 20 Distinct Offices most of them at close proximity to customers. Besides there are five Service centres strategically located at Delhi, Bilaspur, Kolkata, Singrauli and Hyderabad. BEML takes up Maintenance and Repair Contracts(MARC), Annual Maintenance Contracts (AMC) and GPCC suiting customer requirement to ensure equipment availability.